In 1996, in San Francisco’s Precita Park, a young couple was shot dead in a senseless act of meaningless violence. There was no ill will among the victims and their assailant, in fact they were absolute strangers. And because the gunman was ruled incompetent to stand trial, instead ordered to spend his life in a State Mental Hospital, there is the very real possibility that Peace would not have ever come over him, no matter how many peace signs we throw up into the air. But we have no way of knowing for sure. Peace is a state of mind. It is an emotion, a feeling, a way we walk and the way we talk. Peace is only abstract if that is how we view it. Peace cannot be achieved if we are not actively pursuing it. Wars are declared, then action is taken. Peace is wished for, but how often do we work to achieve it. 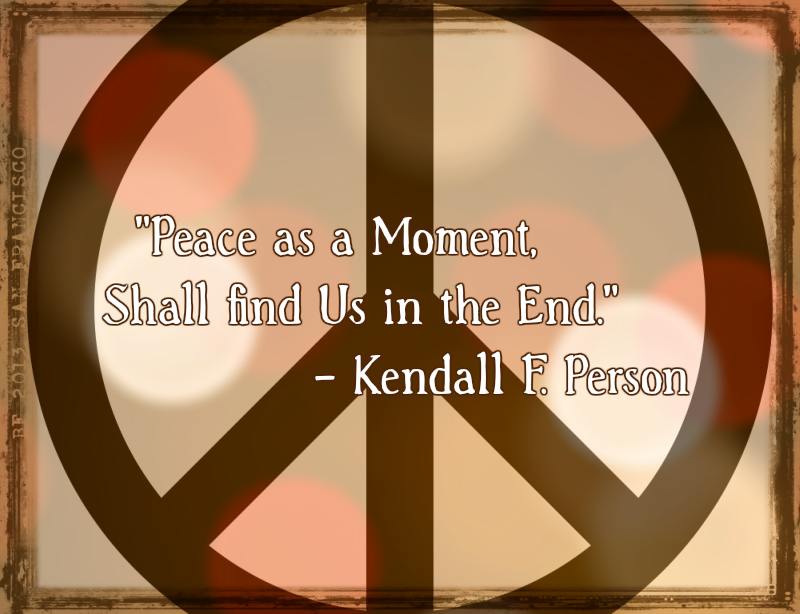 Peace is not easy, but nor does it have to be difficult. But Peace, we will never have it, if we do not give it our full attention. The legacy of Precita Park can be found in a Memorial Park Bench, made from melted guns, captured in a zoom lens. If we can imagine Peace raining down from the sky, then maybe it was the Virgin Mary, who many people said they saw, days after the murders of Carlos Hernandez and Sylvia Menendez. Maybe it was just their imagination or maybe it was a bigger sign sent from God himself. That we have to do something or there will never be peace on earth. World peace has to start with everyone wanting it. I think there is so much greed, prejudice and pain that we may never know world peace. But we can make an area of peace around ourselves to help spread the idea and a glimpse of what it should be like. Thank you for an inspiration for a future blog!! I never knew about this horrible crime. I don’t believe in the death penalty, but I also don’t believe in insanity pleas allowing someone to NOT go to jail. In a crime of passion, you know the person will most likely not commit another crime, but when a crazy person (like Jeffrey Daumer) is brought to justice, you just know they will do it again, as often as possible. Mentally ill murderers should never see the world as a free person again. Thanks for this blog and these activities. I feel better knowing people like you are in the world. P.S. You might want to contact Reverend Michael Beckwith. He may be very interested in what you are doing. I’m glad that you told their story. I often don’t know how to respond until I’ve had a chance to think. I think that we must wage peace as passionately as we wage war. This is what I got from the response of the people of the Precita when faced with a preventable tragedy and this is what I see in your Blog and in the other people who participate in it. I’m proud to be in the neighborhood. Join me in 7 days of Peace in the Neighborhood. YEAH! Some really good points on how peace is not just some abstract idea, but an emotional manifestation (like love or happiness) that will not happen unless we actively work towards attaining it. This is going to be an epic week in The Neighborhood! Join the neighbourhood in throwing up that peace sign. I always smile when this bud is somewhere around..
Ladies & Gentlemen… Photographer Robert M. Goldstein is here.